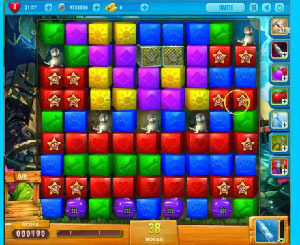 These Pet Rescue level 673 cheats and tips will help you beat level 673 of Pet Rescue. The objective of Pet Rescue level 673 is to rescue 9 pets and get 20,000 points. To start the board in Pet Rescue Saga level 673, you will have a balloon in the center. The balloon will be the same color as five of the pet cages at the bottom of the board. Activate the balloon to clear the pets from their cages. Once the balloon has been popped, the board will fill with more blocks for you to make combinations with. Look to make large combinations to start unlocking the rest of the pets. The large combinations that you make will help to fill up the rocket booster more quickly. Look to activate the rocket booster when it is ready. Place the rocket booster in a column where there are pet cages. It may take some time to unlock the other four cages, so the rocket booster can help you to do this more effectively. Once you have cleared the pets from their cages, look to make large combinations underneath them. The large combinations will help you to drop them down to the bottom more efficiently. Be aware that there are metal mesh blocks that will drop down the board. Look to clear the mesh blocks from the board when you have the chance.